For finely detailed models, spray painting is the best way to go. Floquil® Polly Scale, when used with an air brush, gives great results. If brush painting is necessary, apply a coat of Floquil Barrier® and then apply paint sparingly. An alternative is to use various light coats of commercial spray paints. Care should be taken not to apply the paint too heavily. Heavy coats of paint will cover the fine details on the part and can cause dissolving or “orange-peel” effects. We find that after painting, detailing can be done with brushes and acrylic paints. Thin the paint to flow easily over your surface. 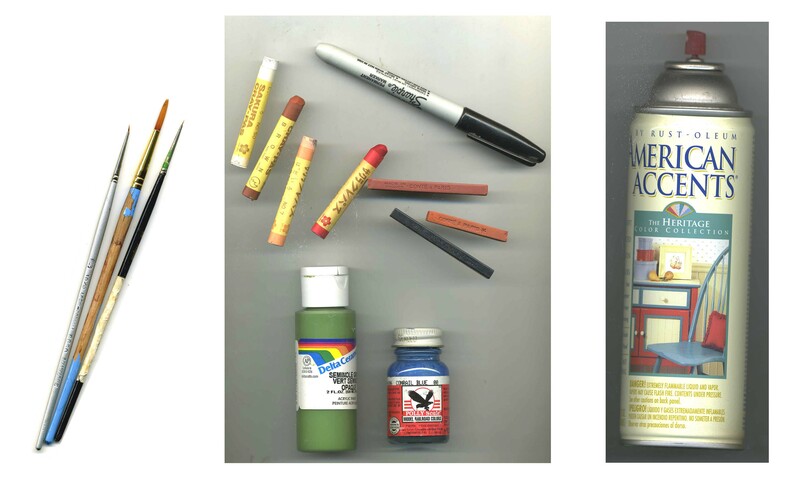 Once your paint is completely dry, weathering and texturing can be done with pastel chalks or conte crayons. Just lightly stroke the crayons over the raised details to give the pieces more definition. If desired, you can add a coat of spray sealer over the project once this is done. One final tool we find useful is a permanent marker. Try painting a window white, then lay a Sharpie® on its side and stroke it over the outer frame. This results in a white interior window frame with a nicely delineated black outer frame. Proper painting techniques and equipment are not only important to the overall appearance of a model, but also help to bring out and enhance the fine detail that styrene injection molding makes possible. Strikingly realistic results are possible using an air brush to apply several very light, successive oversprays of different colors over a base or primer coat. Previous colors should always be allowed to “bleed”, or show through. When styrene is used to represent wood, it should be distressed prior to the beginning of assembly. Very light distressing with the tip of a jewelers file may also be done after each overspray in order to bring out the “grain” and give contrast between individual “boards”. Using Floquil® colors, the following sequence of coats has been found to give excellent results for red freight cars. Thin the paint 50/50. Begin with a coat of gray primer. Follow this with successive coats of Roof Brown, Depot Buff, Grimy Black, and a 50/50 mixture of Box Car and Tuscan Red. Add a final coat of Boxcar Red. When the final color is a lighter version of the basic color, as for example, Boxcar Red is to the deeper red of the previous overspray, the natural air pattern from the air brush will allow fine details to be subtly highlighted, and, therefore, to be more visible. After applying decals, a very light overspray of colors (such as Dust, Foundation or Grimy Black) can be used to tone down the decals and to kill any shine from the decal film. As with any new technique, some experimentation on scrap materials is recommended before trying on newly assembled models.